The DCLeaks document dump exposes the pro-Islamist Left's sinister attempt to slime truth-tellers about Jihad. Radical left-wing billionaire George Soros developed a strategy five years ago to publicly disparage, delegitimize, and marginalize conservatives like David Horowitz who go to great pains to warn Americans about the threat posed by political Islam and the ongoing Islamization of the U.S. It is part of the Left’s push to create an alternate reality in which world temperatures claimed to be rising at an imperceptibly slow rate pose more of a threat to mankind than militants flying commercial jetliners into skyscrapers. He is an enabler of Islam which has been expanding by conquest and deception for 1,400 years. To put things in Islamic terms, Soros’s proposed mass importation of Muslims would expand the ummah, or community of Muslims, by means of what Muslims call hijrah, or jihad through emigration, from the Islamic world, the Dar al-Islam (house of peace), to the Dar al-Harb (house of war). Soros’s affinity for Islam makes perfect sense. Nazi sympathizers and Islamists have much in common. It is fair to say that Islamic terrorists are the last of Adolf Hitler’s World War Two coalition partners that have yet to be vanquished. The end goal for Soros, long the preeminent funder of the Left, is to weaken America by making the country safe for Islam, a fascistic, religion-like ideology founded by Muhammad in the seventh century after the birth of Christ. Soros urges the dissolution of borders and demands that the U.S. accept unlimited immigration, including from regions that produce people who hate America and its values and founding principles. A constellation of well-heeled funders are part of a long-term campaign aimed at making the tenets of Islam acceptable in American society and glossing over the problems associated with importing terrorism-prone Muslims. The 86-year-old Soros, whose estimated net worth is now at a record $24.9 billion, is by far the wealthiest of these funders. Secret internal documents from Soros’s primary philanthropic vehicle, Open Society Foundations (OSF), were hacked by DCLeaks and published on the group’s website this past weekend. The memo identifies a plan that calls upon the Center for American Progress (CAP), founded by Hillary Clinton’s campaign chairman, John Podesta, to combat a phantom the Left calls “Islamophobia.” This neologism is wielded as a cudgel against those who dislike Islam and those who are merely skeptical of it. Leftists are determined to stamp out criticism of Islam, and they have an army of nonprofit organizations, foundations, academics, media outlets, and name-calling activists to help them. The 57-member state Organization for Islamic Cooperation (OIC) is onboard with attacking Islamophobia. It wants to outlaw all criticism of Islam in every country on planet Earth. Such criticism is not only blasphemous but also defamatory, according to Islamic thinking. We need a clearer understanding of what by all indications is a well-orchestrated and well financed system by which right-wing think tanks, pundits, and politicians are able to introduce false narratives and flawed research into the media cycle and use their misinformation to manipulate public opinion and thwart progressive counterterrorism policies. convene in the first quarter of 2011 two dozen experts, including representatives of progressive organizations and the Arab, Middle Eastern, Muslim, and South Asian-American (AMEMSA) community, to formulate strategies for combating anti-Muslim xenophobia. CAP took Soros’s money and did his bidding. Even today CAP is working hard to convince Americans that this make-believe mental illness of Islamophobia is a threat to American democracy and pluralism. CAP claims a $57 million network “is fueling Islamophobia in the United States.” The group created a sophisticated, flashy website (Islamophobianetwork.com) that identifies leading alleged Islamophobes. The site draws upon “Fear, Inc.: The Roots of the Islamophobia Network in America,” a 2011 CAP report, and “Fear, Inc. 2.0: The Islamophobia Network’s Efforts to Manufacture Hate in America,” a CAP report from 2015. 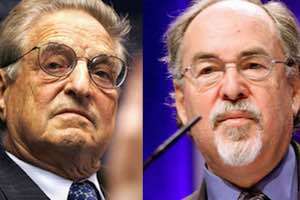 The Podesta-founded Center’s top six targets for vilification are: David Horowitz, founder and CEO of the David Horowitz Freedom Center (DHFC); Robert Spencer, co-founder of Stop Islamization of America, director of the DHFC-affiliated Jihad Watch, and vice president of the American Freedom Defense Initiative; Frank Gaffney, founder and president of the Center for Security Policy (CSP); Steven Emerson, founder and executive director of the Investigative Project on Terrorism (IPT); Daniel Pipes, founder and president of the Middle East Forum (MEF); and David Yerushalmi, founder of the Society of Americans for National Existence (SANE), and general counsel for CSP and Stop Islamization of America. The site also directs fire at author and activist Ayaan Hirsi Ali, a Somali-born ex-Muslim who is a fierce critic of Islam. Soros’s “U.S. Models for Combating Xenophobia and Intolerance” memo is both an important leftist document and a window into the thinking of Soros operatives. It shows their preference for far-left talking points over the dispassionate analysis of facts. It also ought to disabuse any readers of the notion that OSF, formerly known as the Open Society Institute, is bursting with good people with good intentions. Many of these people viscerally hate those who disagree with them, viewing them not merely as ignorant or misguided, but as evil. The memo is also a character assassination roadmap that enlists the assistance of disreputable left-wing groups including Media Matters for America, Muslim Public Affairs Council, and the Southern Poverty Law Center. ACLU alumna Beeson replaced current Democracy Alliance president Gara LaMarche in 2007 as U.S. Programs director at OSF. She now runs of the Center for Public Policy Priorities in Austin, Texas. Chang managed OSF’s National Security and Human Rights Campaign but it wasn’t clear at time of writing if she still worked at OSF. She was previously senior litigation attorney at the Center for Constitutional Rights, a virulently anti-American public interest law firm. Harvard-trained LaBrie is director of philanthropy at L+M Development Partners in New York City and a board member of the Urban Justice Center. The 2011 strategy memo is a template for a well-funded smear campaign against critics of Islam, associating them with the shooting that January of then-Rep. Gabrielle Giffords (D-Ariz.). The attack “provides a grim backdrop to U.S. Programs’ consideration of rising xenophobia and intolerance.” The shooter, Jared Lee Loughner, turned out to be a paranoid left-winger. America is a fetid hellhole of racial and religious hatred, the memo continues. The memo authors recommend that Open Society Foundations contribute $200,000 of the project’s $225,000 budget. It states that as of that point in time OSF had given a total of $6,759,991 to CAP. However, IRS filings show that if OSF grants and grants from Soros’s other philanthropy, the Foundation to Promote Open Society, are combined, the total amount given to CAP rises to $10,541,376. The OSF grant to CAP does not appear in philanthropy databases. Three separate $200,000 grants—two in 2011 and one in 2013—to CAP for an “anti-Muslim bigotry” project do appear but they come from the Foundation to Promote Open Society. OSF acknowledges it approved a $150,000 grant for FECC in 2009 and planned to give an additional $110,500 to its apparent fiscal sponsor, the American Federation of Teachers Educational Foundation. “Because FECC does not have its own 501c3 status, the coalition members decided to house the staff coordinator position at the American Federation of Teachers Educational Foundation,” the planning document states. In fact the Academic Bill of Rights was drafted to protect students from abusive, indoctrination-oriented professors with the goal of returning the academy to traditional principles of open inquiry and true academic freedom that puts students and teachers on an equal footing. The lesson is simple: We need to isolate the Islamophobia network. That means demanding the media not give a platform to this small cadre of voices. That also means demanding that politicians divorce themselves from the network’s propaganda. It’s possible. Shakir’s right. It is possible to smear and intimidate people who want to speak the truth. The Left, surfing on a tidal wave of Soros money, does it every day.